A private, members-only, pool located in the Lake Claire neighborhood of Atlanta, Georgia. Lake Claire Pool is a private pool with members from Lake Claire, Candler Park, and our surrounding communities. Our membership is at full capacity but you can join our waitlist through this website during the swim season (mid-May-mid September). State-of-the-art saltwater pool. Gentle on the eyes, hair, skin and swim suits. What is going on with the construction this summer? The pool season is mid May through mid September and is open daily from 6am to 9pm with Lifeguard hours from 10am to 9pm (varying with school schedules). We are a swim at your own risk pool. Check the pool calendar for hours and events. I haven’t received my annual dues invoice yet. Who do I contact? Please contact us at info@lakeclairepool.com immediately to be sure we have your most updated email address. Annual dues are due no later than April 1st. Membership dues not paid by April 15th risk termination. How do I become a member of Lake Claire Pool? We are at full capacity but you can be added to our waitlist. There is a one-time fee of $100 to be placed on the waitlist. You can only join the wait list March-August. Find out more here. Where am I on the waitlist? Please email us after April 30th. We will have a better idea of new memberships offerings once annual dues are renewed. Am I able to transfer my membership to another person or family? No. Memberships are not transferable. Please read membership policies posted online. If sell my house, can I transfer or sell my membership to the new owner? Pool memberships are not transferable. However, should you choose to resign your membership when you sell your home, Lake Claire Pool (LCP) will offer the new homeowner the option to purchase a membership (no waitlist). You must notify LCP in writing (email) and the new homeowner must apply for membership within 60 days of closing and pay membership initiation fee and annual dues. See section 3 of your pool membership policies for details on termination and transfer of membership. I lost my pool key card. How do I get a replacement? There is a $75 fee to replace your keycard. Only one access card issued per membership. Members, please click here to order a replacement. Is Lake Claire Pool a community pool? Do you have daily rates? No. Lake Claire Pool is a private-members only pool. See membership details below. Who cleans and maintains the pool? We use a pool management company to maintain the pool. They also staff and train our lifeguards. The lifeguards test the pool water many times a day and deep clean the pool several times per week, more if needed. If you notice anything of concern, please let our lifeguards know. Where do I report safety concerns? If an emergency, report it to the lifeguards immediately and/or call 911. If this is not immediate but just something we should be aware of, them email info@lakeclairepool.com. Are members allowed to make music requests at the pool? Yes. Lifeguards will take music requests as long as the music does not have profanity or inappropriate content. I like to read and relax while at the pool and the music is too loud, what should I do? Please ask the lifeguard to turn off the music—or to lower the volume. Lifeguards have been instructed to take “no music requests” over music. When does the pool season begin and end? Depending on weather, the pool opens weekends in mid May. The Saturday before Memorial Day weekend kicks off the season and the pool stays open daily through Labor Day and weekends through September. Lifeguard hours are more limited when school starts back in August. Do you offer swim lessons at Lake Claire Pool? We do have swim lessons at the pool for members only. Please visit the lifeguard shack for information or visit the Wahoo Swim Team website for info about swim lessons. Is there a swim team and, if so, when do they practice? We have a thriving swim team called the Lake Claire Wahoos! The swim season is mostly in June with practice Mon-Sat mornings from 8-10am. The pool hosts a couple of meets usually on Tuesday evenings and we make sure members are notified as the pool is closed to members during that time. To learn more, visit The Wahoo Swim Team web site. Invoices will be e-mailed by March 1st. Full payment is due no later than April 1st. A $100 late fee will be applied after April 1st. After April 15, membership risks termination. Contact info@lakeclairepool.com if you did not receive an invoice, or if your email has changed. We are at full capacity but will reach out to those on the waitlist starting April 15th. The typical timeline from joining the waiting list to receiving a membership offer is approximately 3 years. There is a $100 fee to join the list – this encourages only serious applicants and keeps our wait list under control. Click here to join the waitlist. A complete list of pool rules is posted on the website under Membership Info and should be reviewed carefully. The rules below are extra helpful reminders to members each season. Thank you for your cooperation. Lifeguards have the authority to enforce all pool rules. Contact the Head Lifeguard or Pool Manager with concerns. Lifeguard hours are daily from 10AM to 9PM (with slight schedule shifts early spring and late summer). Use of the pool outside of lifeguard hours is at your own risk. Socializing with or distracting the lifeguard on duty is prohibited. Please bring concerns to the lifeguard working in the guard shack. One lap lane is kept open for members wishing to swim lengths undisturbed. Persons not swimming lengths should remain in other pool areas. For effective use, when more than 2 swimmers are in a lane, swimmers should swim counterclockwise near lane markers and pass in the middle. Children under 14 years of age are not allowed in the pool area unless accompanied and supervised by a responsible adult who is at least 19 years old. Noodles, floating lounge chairs, inner tubes, and rafts are not permitted in the pool. 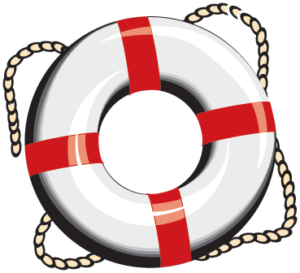 Coast Guard approved personal flotation devices (PFD’s) may be worn (such as water wings or swimmies). Any person wearing a PFD must be accompanied by an adult and be within arms reach. Fireworks, weapons, glass containers, pets (other than recognized service animals), balls (other than small, soft, cloth varieties), water guns, bicycles and skateboards, fishing, and diving equipment (other than a mask and snorkel), are not permitted at the pool. Running and noisy or hazardous activity not permitted in the pool area. No pushing, dunking, dangerous games or throwing of balls, frisbees, wet clothing, or other. Diving is prohibited except in designated areas. Diving board users must be able to swim to the ladder unassisted. PFDs may NOT be worn when going off the diving board. No general swimming is permitted in the diving area. NO GLASS is permitted at the pool. Bring beverages in cans or plastic bottles. Glass includes bottled beverages, ceramic coffee mugs, salad bowls, etc.. Coolers may be checked by lifeguards. NO GUM inside the pool gates; chewing gum is all over the deck, in the water and has gotten into the pumps and filters. Patrons are responsible for disposing of their food and beverage containers, candy wrappers and other trash–this is especially important to prevent pests. Lifeguards have general cleaning duties but are not responsible for cleaning up after guest’s meals and snacks. Members must bring their key access cards to enter the pool gate. Be prepared to show ID if you do not have your access card. Guest fees are $5 per guest payable by cash or check. Limit of 5 guests per visit. An ADULT member must accompany guests—your guests cannot enjoy the pool without your company. Lifeguards DO NOT monitor the baby pool. Use of the baby pool is restricted to children 5 years and under–each child must be supervised by a responsible adult and not left unattended. Children who are not toilet trained are required to wear swim diapers covered by separate plastic pants, which must fit snugly around the legs and waist, under their swimsuit. Plastic pants can be purchased at the guard shack. Any non-swimming children and those wearing a PFD (water wings, swimmies) must be within arm’s reach of a responsible adult at all times. Diaper changing is not permitted in the pool area; please use the changing stations in the locker rooms and dispose of diapers in the marked trash bins in the restroom (not in pool area trash bins). Changing diapers on poolside chairs or tables that members eat off of is unsanitary. Diving is prohibited except in designated areas. Diving board users must be able to swim to the ladder unassisted. Personal Flotation Devices may NOT be worn when going off the diving board. Parties will be booked through the pool management company. Please check back here for a link. Before submitting a request please check the Pool Calendar. © 2019 by Lake Claire Pool. All rights reserved. No part of this document / website may be reproduced or transmitted in any form or by any means, electronic, mechanical, photocopying, recording, or otherwise, without prior written permission of Lake Claire Pool.